Journal de La Reyna (World News Today): ABC Sitcom May Offend The Asian-American Community! ABC Sitcom May Offend The Asian-American Community! 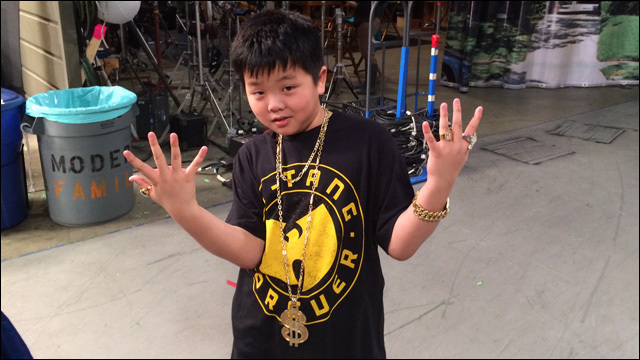 Actor Hudson Yang plays a mock version of celebrity chef Eddie Huang in the upcoming ABC sitcom Far East Orlando. The sitcom is based off the book Fresh Off The Boat. Since the days of actress/comedian Margaret Cho with her hit sitcom All-American Girl, the American Broadcasting Company decides to rehash another sitcom based off the life of an Asian American. Celebrity hip-hop cook Eddie Huang's book Fresh Off The Boat is being spun into a 2014 sitcom. Mediaite reports that ABC has called the show Far East Orlando. The sitcom has pissed off Eddie Huang and many others in the Asian American community. Huang born in Washington, DC but grew up in Orlando wrote Fresh Off The Boat to share his experiences growing up there. The tittle itself "FAR EAST" is pretty offensive to say at least. The show isn't being taped in the gun crazy state of Florida. It's being written by people who have no clue about the life of Eddie Huang. ABC so far has no comment about the title but could we be hopeful that they change the tittle? Huang went to Twitter to express outrage over the sitcom. Hudson Yang To ABC Comedy Pilot 'Far East Orlando' http://t.co/az0G94Xh2F @deadline TELL ABC YOU WANT IT TO BE CALLED FRESH OFF THE BOAT! @MrEddieHuang @ABCNetwork "Far East Orlando" is straight corny. Any thoughts to this sitcom? What exactly is the "Asian-American community?" "Asian-American" asserts that everything "Asian" is the same, which makes as much sense as saying "European-American", aka none at all. Just like in Europe Asia is full of different cultures and peoples. There are, of course, similarities among them, like in Europe. In Europe the uniting factors are the Roman empire and Christianity. In Asia it's China, Buddhism and Confucianism. That is where it starts and ends. Outside of that both continents feature plenty of diversity. Just look at the languages, cultures and national mentalities. The family in "Fresh Off The Boat" is Taiwanese. That is very distinct. They're not Japanese, they're not Vietnamese, they're not Bangladeshi, Indian, Indonesian or Iranian. The blanket term "Asian-American" doesn't work. Pop Singer's Bodyguard Smacks Up Fan! ACA (aka Obamacare) Signup Deadline! O'Reilly's Feud With Barbara Lee Continues! Washed Up Rapper Shot By His Nephew! Loserville Sics "Uncle Juan" On Ebony! Conservative Outrage Over Stephen Colbert! Road Rage Left Florida Redneck In The Dust! No, No, No, Judge Joe Brown! Euro Paper Throws The Monkey At The Obamas! Texas Town: Please Disinvite Yourself Ted! White House: Drudge Telling Lies! Mom Gave Tot A Lil' Drank Got Locked Up! Anti-Gay Bigot Fred Phelps Passes Away! White Extremist Rally Flopped In Cincy! Chris Brown's Iron College Stay Is Imminent! The Racist Right's War With Jay And Bey! Drizzy And RiRi: Are They An Item? Chris Brown WILL LIKELY Go To The Iron College! Dems Might Attack Greg Abbot's Disability! Don't Underestimate The Racist Right! Lois Lerner Attacked By The Racist Right! Isaiah Washington Returns To Grey's Anatomy! GOP Obstruction Claims Another Obama Nominee! It Was The Phone That Killed Cali Teen! It's Maybe Curtains For Radio Shack! Dumba**es Robbed Laboring Pregnant Woman In MD! Runaway Ohio Teen And Her Abductor Are Caught!